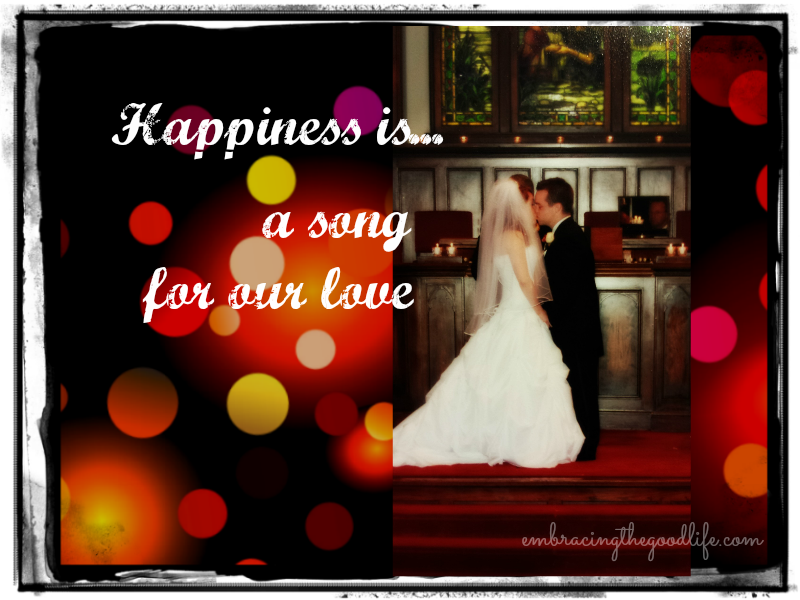 I’m feeling very blessed today as Hubby and I are celebrating our 7th Wedding Anniversary. In our married years we’ve bought a house and created a home, we’ve grown from a family of 2 to a family of 4, supported each other in career decisions and started 2 successful businesses, endured illness, and have experienced many blessings hand in hand together. That’s how we do everything…hand in hand. I never imagined a life like this. My Hubby and I met almost 13 years ago and fell deeply in love. We’ve grown up together and learned each others ways. He’s more than I deserve but then he would say the same about me. Our love is filled with hugs and kisses goodbye, kisses goodnight, and holding hands. Thank you for asking me the question I said yes to 7 years ago today! The words I Love You don’t seem like enough but they will have to do…Happy Anniversary! I love you!!! Such a sweet and simple love song that reminds me of our young love that will never grow old.